Street trees are an integral component of the urban environment and provide tangible benefits to the urban environment. Their shade and beauty contribute to the quality of life by softening the hard appearance of buildings and infrastructure (i.e., utilities, roadways, etc.). 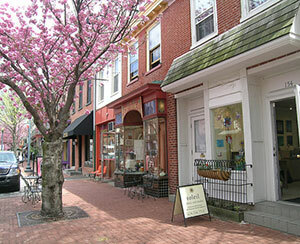 They improve real estate values, create attractive settings for commercial businesses, and enhance neighborhood appeal. Trees decrease energy consumption by providing shade and acting as windbreaks. They reduce water treatment costs and impede soil erosion by absorbing and slowing stormwater runoff. Street trees cool and remove pollutants from the air and produce oxygen while absorbing carbon dioxide. For these reasons and more, municipalities should encourage or require the provision of street trees as part of new land developments and new construction. Street trees also need to be proactively managing and maintained for them to continue their aesthetic and ecological functions. Energy Conservation: Street trees conserve energy by providing shade and reduce heat islands associated with pavement. Improved Aesthetics: Street trees make a street look more attractive. Buffering: Street tress can serve as the buffer between vehicular and pedestrian traffic in a complete streets deign. Environmental and Economic Benefits: Street trees provide significant benefits in terms of air quality, temperature moderation, traffic noise attenuation, property values, traffic calming, erosion control, and improved public safety through the reduction of solar glare, and reducing fog density along roadways. Stormwater Reduction: Street trees absorb stormwater, thus limiting the potential for flooding. Potential Conflicts with Utilities: Street trees when improperly installed can interfere with overhead utilities and the root growth and structure of some varieties can buckle sidewalks and/or invade subsurface utility lines. Falling Leaves: Deciduous trees deposit leaves on the road surface during the fall, which can be a road hazard. Maintenance: Street trees require periodic maintenance. Requirements for the installation of street trees in new developments could be incorporated into municipal ordinance language. The introductory paragraph to the Pennsylvania Municipalities Planning Code empowers all municipalities in Chester County to enact ordinances that, among other things, promote the conservation of energy, and street trees can assist in this area. Callery Pears (pyrus calleryana): These are very popular trees with municipalities due to their flowering character, but certain cultivars, particularly the 'Bradford' has a weak branching structure and are susceptible to storm damage and thus have a limited life span, and could damage cars and other elements beneath them when they fail. Ash Trees (fraxinus): Due to the threat of the emerald ash borer insect, there is the potential that ash tree plantings may not survive very long. Native trees should be planted whenever possible. Ginkgo biloba trees are very good street trees, however they should always be the male of the species. Females produce odorous fruit and should be avoided. Monocultures (all trees being the same species) should be avoided to encourage variety and avoid decimation of all trees in the case of a disease that attacks certain species, such as the American Chestnut, American Elms, and the Ash tree reference above. Structural soil should be used in urban streetscapes. It is a material developed by Cornell University that when installed provides for more root growth area for trees beneath sidewalks while providing structural support for the walkway above. North Coventry Township Subdivision and Land Development Ordinance Section 320-54.C. West Whiteland Township Subdivision and Land Development Ordinance Section 281-36. Willistown Township Environmental Protection Ordinance Section 73-54. East Pikeland Township Subdivision and Land Development Ordinance Section 418. Lower Oxford Township Subdivision and Land Development Ordinance Section 22-520.C. A U. S. Forest Service evaluation of how trees can pay us back.